Sterling silver dinner service in Modern Classical Scroll. Made by Georg Jensen in Copenhagen. 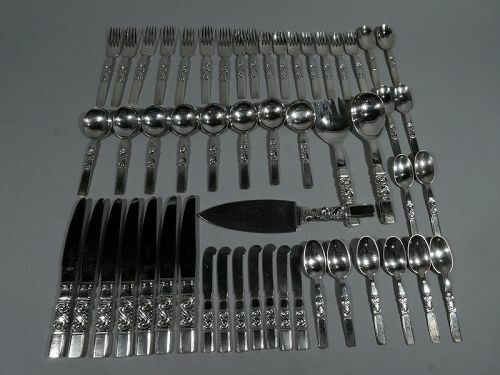 This set comprises 53 pieces: Forks: 7 dinner forks (7 1/8), 2 lunch forks (6 3/8), and 7 salad forks (6 1/4); Spoons: 12 teaspoons (5 7/8) and 8 round soup spoons (6 1/4); Knives: 7 dinner knives (8 7/8) and 7 butter spreaders (5 3/4); Serving pieces: Pie server (10 1/2); salad pair with spoon (9 1/4) and fork (9 1/8). 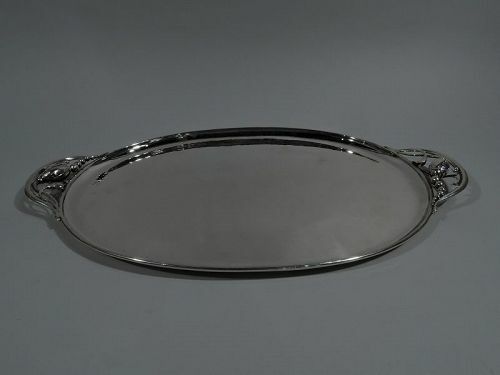 Desirable sterling silver tray in classic Blossom. Made by Georg Jensen in Copenhagen. Oval well and open c-scroll end handles inset with seeding pod and tendrils. Presentation dated 1930 engraved on underside. Visible hand hammering with nice shimmer. A wonderful piece in this Art Nouveau pattern, which was first produced in 1905. Fully marked with two early maker’s stamps for 1915-30 and 1926-32. Numbered 2E. Fine condition. 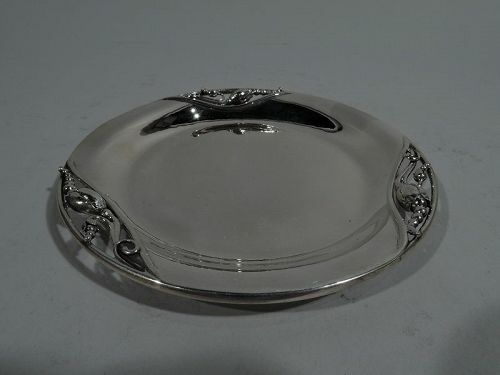 Prewar sterling silver Blossom dish. Made by Georg Jensen in Copenhagen. Round with open rim inset with seeded pods. A nice piece in this Art Nouveau pattern, which was first produced in 1905. 1930s hallmark with no. 2A. Very good condition. 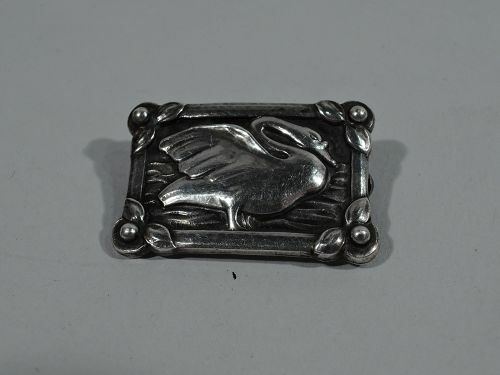 Art Nouveau sterling silver brooch. Made by Georg Jensen in Copenhagen. Two stylized tulips with scrolled stems. A very nice early piece designed by Jensen himself. On back engraved three-letter script monogram and year 1936. Pre-1931 hallmark with no. 100B. Fine condition with deep patina. 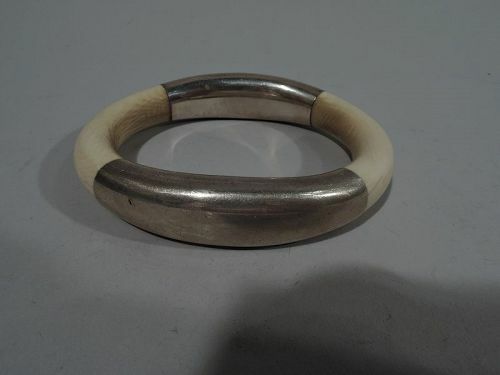 Midcentury Modern sterling silver bracelet. 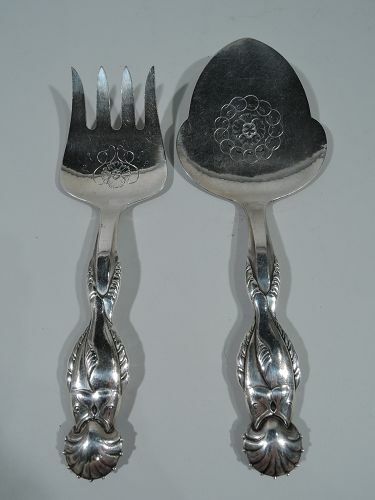 Made by Georg Jensen in New York. Smart and snug bangle. Postwar hallmark and no. A33A. Very good condition. 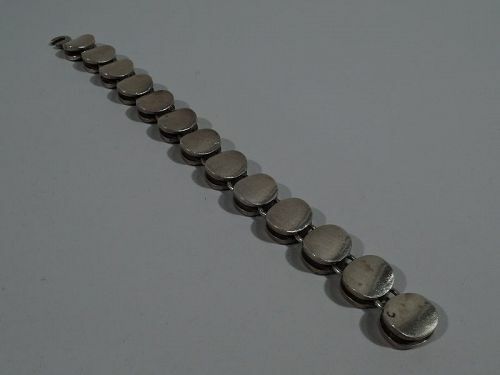 Midcentury Modern sterling silver bracelet. Made by Georg Jensen in Copenhagen. Alternating double ovals and circular links. Spare and supple. 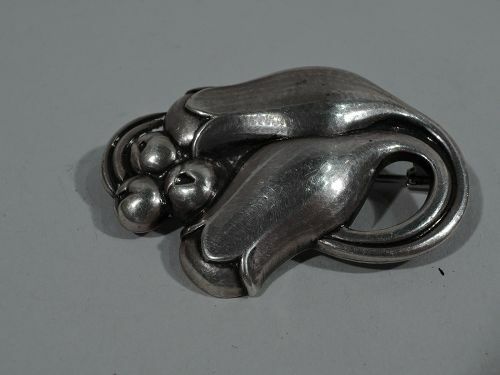 Designed by Nanna Ditzel, who was a major influence on Danish jewelry. Postwar hallmark with designer’s stamp and no. 124. Very good condition. 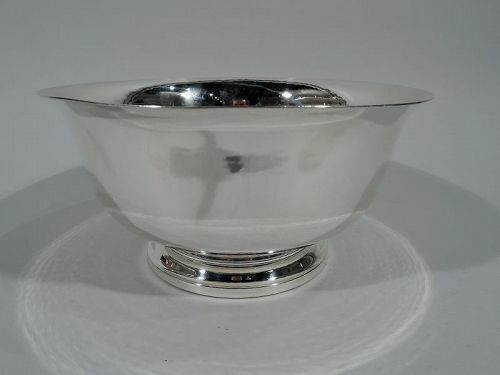 Art Deco sterling silver bowl. Made by Georg Jensen in Copenhagen. Round with curved sides and flat rim. Applied berry bunches and incised notches. Visible hand hammering with nice shimmer. Fully marked with 2 early maker’s stamps from 1915-30 and 1926-32. Numbered 271B. Very good condition and patina. 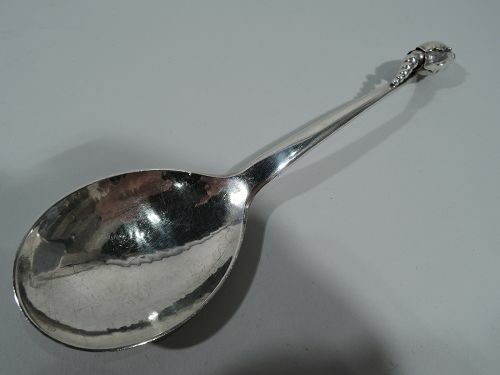 Early 830 silver serving spoon in Viking pattern. Made by Georg Jensen in Copenhagen, ca 1931. A rare piece in a pattern designed by the master, and first made in 1927. It is no longer in production. Fully marked with maker’s stamp (1915-30), Three Tower stamp (1931), and Christian F. Heise assayer’s stamp (1904-32). Very good condition with deep patina. 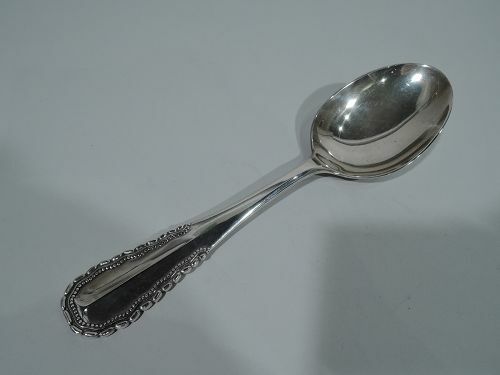 Art Nouveau sterling silver serving spoon. Made by Georg Jensen in Copenhagen. Oval bowl and tapering shaft with classic terminal in form of seeds spilling out of closed bud. Visible hand hammering A desirable piece in this pattern. Postwar hallmark with no. 84. Very good condition with a nice shimmer. Early 830 fish serving slice and fork. Made by Georg Jensen in Copenhagen in 1925. 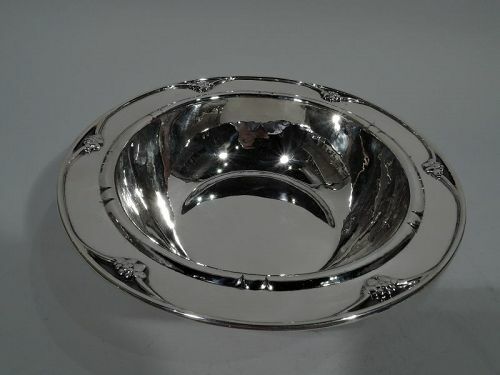 Beautifully hand-hammered sterling silver Revere bowl. Retailed by Georg Jensen Inc. USA in New York. Traditional form with curved sides, flared rim, and stepped foot. Probably made by Worden-Munnis, a Boston maker that was founded in 1940 and specialized in historic reproductions. Marks include retailer’s stamp, no. 1408, and phrase “P. Revere Reproduction”. Very good condition with nice shimmer.